Downers Grove North beat St. Charles East 25-13, 25-17 Friday at Bartlett to earn its first state finals berth since 1988. A movie ticket cost $3.50. Postage stamps were 24 cents. The Dow Jones closed at 2,168. A former movie actor, Ronald Reagan, was president. And the first game under the lights was played at Wrigley Field. Yes, it’s been a long time since Downers Grove North advanced to the IHSA Girls Volleyball State Finals. How long? Head coach Mark Wasik was in fourth grade. “This is a group of girls who are so coachable, it sounds cliché, there’s like zero resistance,” Wasik said. “They’re all on the same page. They’re all good supporters of each other. They all want it for each other. Nobody wants it for themselves. “Whether we won or lost tonight, this is truly the most exceptional team I’ve ever coached,” he added. Now Wasik will be able to coach them two more times. 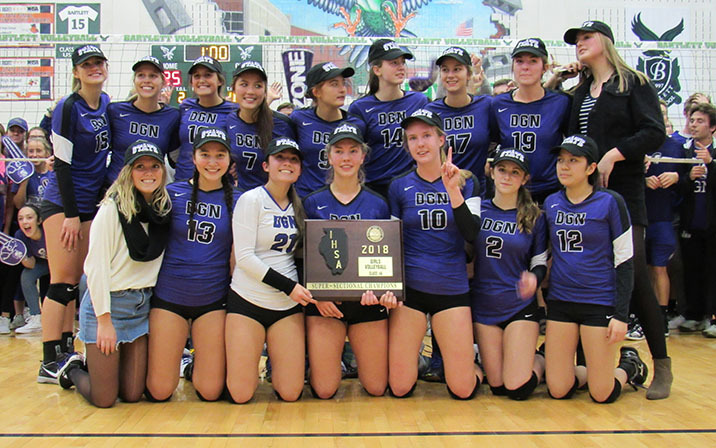 Downers Grove North (29-11) ended a three-decade state finals drought Friday with a 25-13, 25-17 victory over St. Charles East at the Bartlett Class 4A Supersectional. The Trojans will play Prairie Ridge (29-10), a 29-27, 25-14 winner over Loyola at the Warren supersectional, in a Class 4A semifinal at 8:30 p.m. on Friday at Redbird Arena on the campus of Illinois State University in Normal. Friday at Bartlett, Downers North jumped on St. Charles East (25-15) early in Game 1, building a 12-2 lead before many fans had time to get comfortable in their seats. 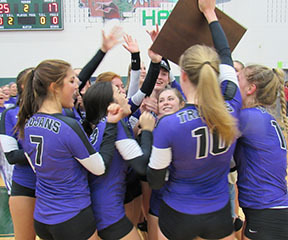 “We’ve come out super hot in every playoff game because we’re just so motivated, so fired up,” said Downers North’s 6-foot senior outside hitter Margaret Mahlke, who led the Trojans with 9 kills, 6 digs and an ace. After closing out the first set on a kill by 5-10 senior Cynthia Brennan (5 kills), the Trojans barely let the Saints catch their breath before taking a 5-1 lead in Game 2. 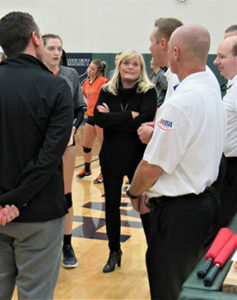 St. Charles East did pull within 11-9 on back-to-back kills by 5-8 senior outside hitter Samantha Urban (team-high 6 kills), but Downers North responded by closing on a 14-5 run. “We knew St. Charles East was going to be a different caliber from what we’ve been playing in the postseason, and that’s no disrespect to our other opponents, but we knew this was going to be a different situation,” said Wasik, whose team lost two previous meetings with the Saints. Senior middle blocker/outside hitter Jade Casper added 8 kills, 7 digs and an ace for Downers North, which also got 25 assists and 5 digs from Elizabeth Dunlap, 5 kills and an ace from 5-11 senior Maddie Degiorgio, and 2 aces from sophomore Mikayla Sweeney. Senior setter Mckenna Slavik closed out her stellar high school career with 3 kills, 1 block, 12 assists and 8 digs for St. Charles East. Junior Lauren Ponder added 12 digs and 6-foot senior middle hitter Kirsten Rogers contributed 2 kills and 5 digs. Meanwhile, Margaret Mahlke, whose older sister Katherine was a standout player in her day at Downers Grove North, will continue living her dream.